When your earliest memory of football is as a two-year-old on the sideline of a Super Bowl watching your dad get an interception on the field then it’s hardly a surprise that you end up with a burning ambition to play in the NFL. 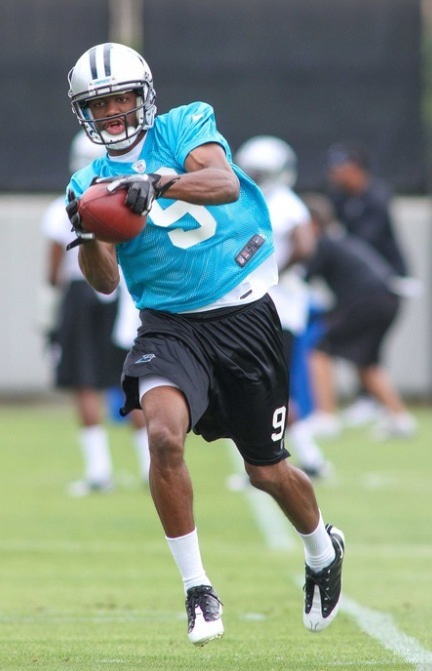 That is the true story of Carolina Panthers rookie undrafted free-agent wide-receiver Jared Green. Green may not have set the College world alight but he is determined to make a big impression in 2012 alongside the 2011 NFL rookie of the year quarterback Cam Newton. NFL FAN IN ENGLAND editor Lawrence Vos (LV) spoke exclusively to the man who hopes to make his NFL debut this Autumn as a wideout and a return man for the Panthers. LV: You are headline news a month ago after being picked up by the Carolina Panthers as an undrafted free agent. How did this happen and what were you doing when you got the call? Also what did you do after finishing the phone call? JG: It happened from a lot of hard work and dedication towards something that not many believed that I could do. I was in my living room when the Carolina Panthers called me with all of my family around me and after the call we ate dinner and celebrated. LV: You will be catching passes from the #1 pick in 2011, Cam Newton, the quarterback who rewrote the rookie record book. What are you looking forward to the most working with Cam? JG: Winning. It’s an honor to have a quarterback that plays at that high of a level. I just want to score touchdowns. And win! 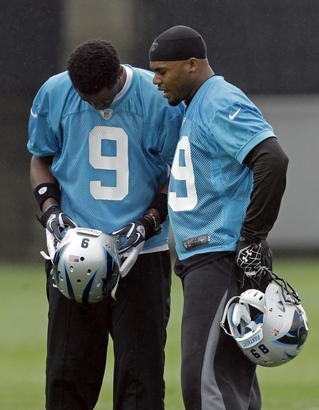 LV: You also get to learn from one of the best wide-receivers in the past decade, Steve Smith. What do you hope to learn from Steve? JG: I’ll look to Steve to help me in making the transition into the NFL and getting over the rookie phase. There’s a lot that goes into the life and play of an NFL athlete. LV: You are known for your speed. Is that your biggest asset or do you have other football skills that best describe what you will bring to the NFL? JG: I’m known for speed because of my bloodlines and the fact that it’s something a lot of people have seen. But there’s a lot more to my game than that. And Lord willing, everyone will see that very soon. JG: Simple. Beat the guy in front of me. JG: I won’t really go into detail but I was contacted a few times during the 6th round but I couldn’t let that bother me. Gods plan is perfect no matter what our little agenda is, so I praised God all throughout and honestly, I’d rather be an UDFA (undrafted free-agent) because my drive is motivated even more now. JG: I was at home with mom and dad and my fiancé. LV: What did your dad say to you after the final pick was made and you were not one of those selected in the draft? JG: By then I had already signed with the Panthers so were celebrating around that time. JG: Wide receiver. I believe this is what I’ve been prepared to be for a whole now. And I have what it takes to make an impact on a game at that position. LV: You famously got into some hot water when you announced that you were transferring colleges on Twitter. How regularly do you Tweet and who do you get the most pleasure following? JG: I tweet here and there. I know it’s completely entertainment and not something to look to deep into but at the same time you can reach a lot of people with it. I only follow family and teammates on Twitter but I hardly ever read my timeline. LV: Please can you describe the amount of pressure on you to succeed in the NFL considering your dad managed two decades in the NFL? JG: None at all. My Dad is my Dad, not the NFL player that the world knows. We are close just like a father and son should be and I’ve done enough to make him proud so everything else is just gravy. JG: Probably at the Redskins Super Bowl in 91 (Superbowl XXVI held on January 26 1992 in Minnesota). I was on the sidelines as a young little kid, overwhelmed. LV: You were coached by Stump Mitchell at Southern. I remember Stump from the 80s, when he was a Cardinal. How much did you know of your coach before you joined the team? JG: I knew about him from my dad. He told me about him and how they played each other a few times. 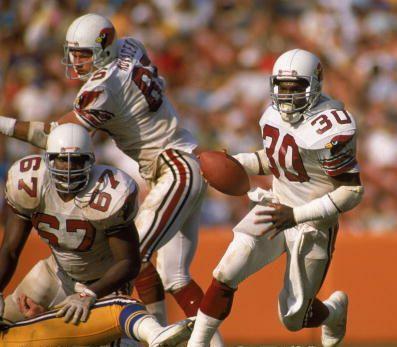 Jared’s university coach Stump Mitchell during his playing days as a running back for the St Louis Cardinals. LV: What are some of the most valuable lessons you learnt from Coach Mitchell? JG: Keep doing what you do best and working on your craft. Don’t worry about what’s going on outside of your control. Just keep working. LV: Who are some of your team-mates that you think should also be given a shot in the NFL and why? LV: What does Jared Green do to relax? Favourite tv shows? Favourite food and drink? JG: I watch cartoons and eat junk food on the couch. The couch is such a relaxing spot in the house. Especially if you have company that doesn’t mind lounging on the couch with you. My fiancé loves to eat candy and watch tv with me. LV: Did you grow up a Redskins fan or did you follow a different team? JG: I was a Skins fan because the guys on the team were like family. But I was a specific player’s fan. 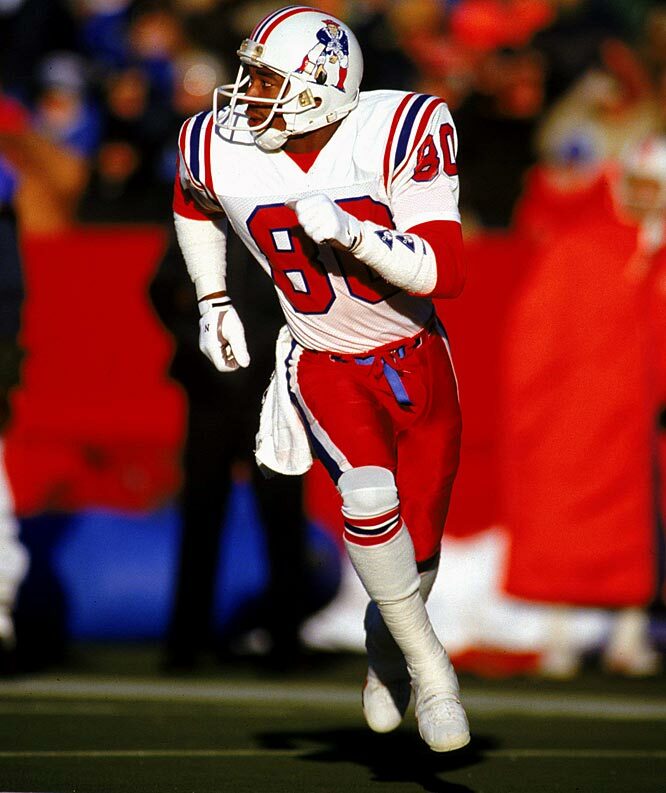 Loved Andre Rison, Irving Fryar, Keyshawn Johnson, and Michael Irvin (LV – all wide-receivers and played in at least one Super Bowl). LV: Which NFL wide-receivers did you admire growing up and which NFL wide-receivers do you admire at the moment? JG: Now days I watch and learn from Chad ‘Ocho-cinco’ Johnson and Steve Smith. They’re the only two I watch in-depth. My dad really likes their heart, routes, and footwork. JG: It’s great. Anytime you can expand somewhere where you have fans that really appreciate what’s going on it’s all love. I think the NFL should definitely branch out. LV: What is your typical training routine and what do you find the hardest part and the easiest part? JG: I lift weights but my real training consists of running hills and cone drills. Speed and explosion is key. Nothing is really hard or easy so to speak. It’s all about what you put into it. I don’t workout to get tired, I do it to get better. LV: If you and your dad were to do a 40 yard dash right now by what distance would you win? JG: It would never happen because he passed down the crown of speed. He and I both know that he was the fastest man in the world in his day. We also know that I now have that Green speed and it’s something to be proud of. JG: I use Jesus. I pray just about every 10 minutes. On the field off the field wherever whenever. 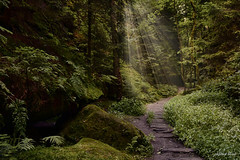 I walk in the Holy Spirit so every step is ordered and I don’t play for any one. I play to give God glory. JG: There’s been a lot of memories. I’ve won a state championship in HS. I’ve made big plays in college against USC, Miami, UNC etc. But my biggest achievement is making it here with the Panthers. LV: You inducted your dad into the Hall of Fame, can you go anywhere near to describe what that event was like and what it meant to you and your dad for you to be up on the podium and see your dad’s bronze bust unveiled? 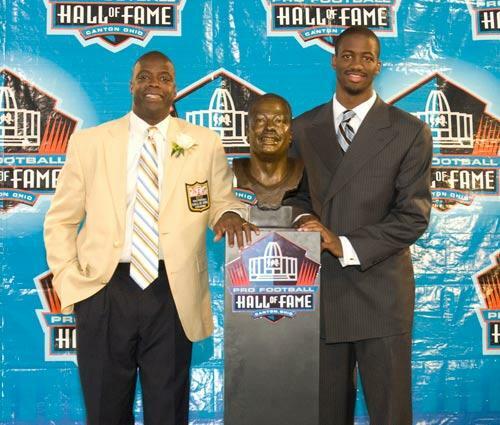 Jared and his Hall of Fame dad with the bronze bust in Canton. JG: I’m a soldier on the battlefield for Christ. Everything I do is for the advancement of the Kingdom of God. JG: No charities yet but Lavar Arrington (LV – former Redskins linebacker and now radio presenter) has brought both me and my father into his new football training company. It’s called XP. Check out xtremeprocision.com . I use this product and it has helped my game tremendously. JG: Fishing, playing cards, eating, being with family. I just like to be outside and having fun. LV: How good a basketball player are you and is the best part of your game? JG: I can ball. I’m a 3 man. But I like to dunk on people. My ups are my biggest asset. Rebounding and dunking. LV: Your dad’s punt return against the Bears in the 1987 playoffs is my favourite play I have ever seen in all my NFL watching. Would you like to return kicks in the NFL if it meant getting on an NFL roster? JG: I’m sure I will be doing that in Carolina. If not ASAP, I will eventually. LV: What is the biggest hit you have ever been given and what is the proudest hit you have ever delivered on someone? JG: I’ve never been hit really hard. The hardest hits I’ve taken we’re in training camp. Chris Long got me one time at Virginia. But the adrenaline gets you so in the zone you’re numb. This game is crazy. 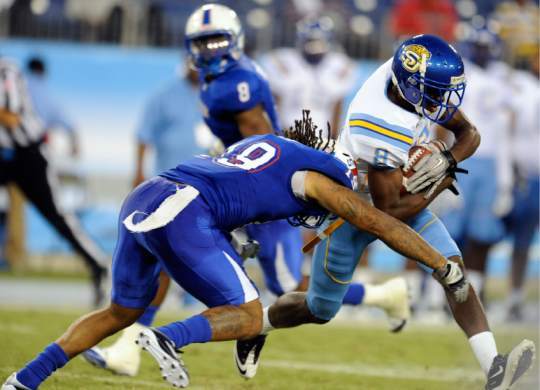 I do remember hitting a safety from Prairie View last year through. It was close to our sideline and I got some oooohs. Put him on his back! LV: Who was the toughest defender you played against and why? JG: Myself. I don’t ever really worry about my opponent, I just have to make sure I’m doing what I need to do in my routes and finishing every play. LV: If everything goes to plan and you get signed to a longer term deal by the Panthers what will that mean to you? JG: It will mean I’m employed. I’ll have a job and I’ll have to keep it. LV: Thank you very much for your time Jared -Everyone in England is looking forward to watching you on our TV screens this Autumn. Interview by Lawrence Vos – 16 June 2012.